After that impressive win away at Garry Monk’s Birmingham Boro look to keep the form going with a home win over Millwall. Last time we met there were scenes on the pitch as Boro finished Neil Harris team play off hopes and cemented our own semi final with Aston Villa. Times have changed and now the team in Blue are looking over the shoulders and cling on in there in the Championship. But for Boro this game is all about convincing everyone that we have finally recovered from the damaging December and that January sees us sale.. err.. sailing back towards the top. See what I did there? Probably best if you didn’t. Anyway, Boro have Ryan Shotton and Aden Flint back in training but Tony Pulis said the main thing was to ensure they can play to the end of the season. So he is unlikely to risk Shotton breaking down again and with the way Danny Batth and Dael Fry have been filling in he will probably keep Flint on the back burner for now also. A come back in the cup against Newport will probably be a better bet. 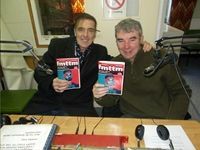 Anyway, we have a new fanzine out tomorrow with a smart Lewis Wing cover and to help celebrate with us hot shot Bernie Slaven joined us in the Southside Studio for hospital radio (James Cook University Hospital) and now available to you in this podcast (below). Always direct, never beating about the bush, Bernie talks transfers (or lack of them), looks back on our bad run and forwards to promising signs at present. He comments on Leeds spygate and can you guess where he cites as having had the worst dressing rooms in the country? The two things are linked. Anyway, do have a listen to the podcast with Bernie. Please buy the fanzine and enjoy the match tomorrow. Let's beat Millwall. Come On Boro and Up The Boro.